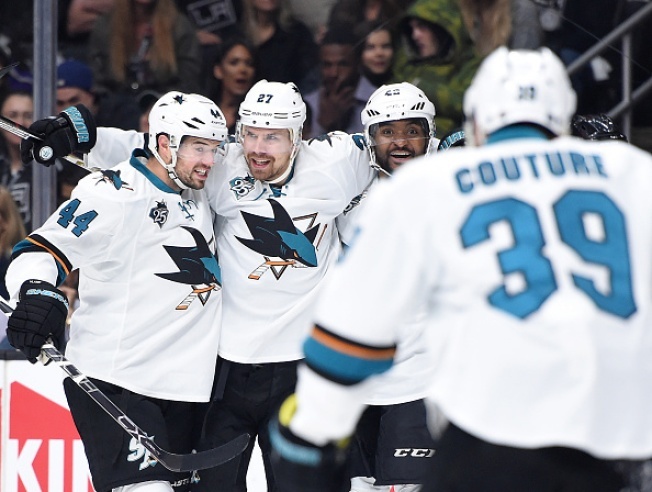 SAN JOSE -– Despite conceding a three-goal lead, the Sharks regrouped and downed the Kings at Staples Center on Friday night, 6-3, winning their first round playoff series over their biggest rival in five games. Joonas Donskoi had a pair of scores, including the game-winner at 3:58 of the third period. The rookie forward held off Drew Doughty while storming up the wall, and eventually got in front of the net to deposit a loose puck off of Brent Burns’ stick to break a 3-3 tie. Joe Pavelski gave the Sharks an insurance marker at 12:24, when his shot from the circle got through Jonathan Quick on a rare bad goal allowed by the Los Angeles netminder. He led all players in the series with five goals. Melker Karlsson’s empty-net goal with 22 seconds to go capped the scoring. The Sharks will face the winner of the Ducks-Predators first-round series that is currently tied at two games apiece. They would have home ice against Nashville, but would start on the road if it’s Anaheim. It’s the first time since 2013 that San Jose, which missed the postseason in 2014-15, has advanced to the second round. 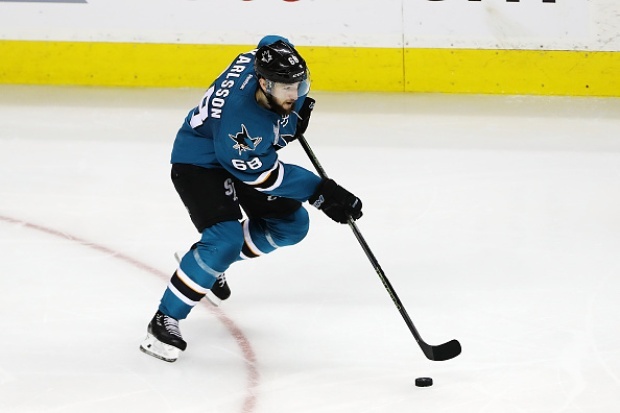 The Sharks jumped out to a 3-0 lead early in the second period, courtesy of three players that had yet to score in the series. The first two came in the opening frame. Donskoi dragged the puck around Jake Muzzin before finding the top shelf over Quick’s shoulder just 1:08 into the game. Chris Tierney’s first goal since Feb. 13 made it 2-0, when he cut to the slot and took advantage of a Tommy Wingels screen at 11:21. Matt Nieto increased the lead to 3-0 when Logan Couture found Joel Ward just outside the crease, and Ward pushed it across where Nieto easily slammed it home at 4:05. The Kings, though, did not go away, and after Patrick Marleau’s weak attempt on a penalty shot at 5:31 of the second was easily denied by Quick, came storming back. First, a point shot by Doughty deflected a couple times and ricocheted in off of Anze Kopitar’s shin at 7:44. It was Doughty’s first point in the series. Some poor defensive zone coverage led to Jeff Carter cutting it to 3-2, when he Kings’ center was left all alone in front of the net and had time to roof it over Martin Jones at 11:26. Los Angeles kept up the pressure and got the equalizer from Kris Versteeg, who deposited a loose puck off of the stick of Kyle Clifford, who hit the post with his blast from high in the zone, knotting the score for the second intermission. Couture and Burns each had three assists. The Sharks won all five of their games at Staples Center this season, including two in the regular season. One game after striking for three power play goals, the Sharks finished 0-for-3 in Game 5. They squandered a five-on-three for 1:45 in the first period while holding a 1-0 lead. The Kings had just one power play late in the first period, and did not cash in. San Jose finished 5-for-21 on the power play in the series, while Los Angeles was 3-for-14. Jones finished with 19 saves. The former Kings backup was in goal for all five Sharks wins at Staples Center, and is now 4-1 in his career in the postseason. Quick allowed five goals on 27 shots and fell to 46-35 in his career in the playoffs. Both lineups were unchanged from Game 4. Kings forward Vincent Lecavalier played his final game in the NHL, as he’s expected to retire after a 17-year NHL career. The schedule for the second round will be announced at a later date.